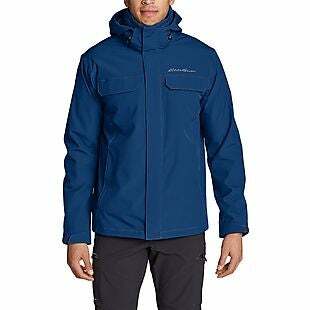 This men's Eddie Bauer 3-in-1 Lone Peak Jacket lists at $199, but you can get it for $70 when you apply the code APRIL50 during checkout at Eddie Bauer. Shipping adds $9.99. Otherwise, it's free on orders over $99. That's 55% off the list price. The jacket has a waterproof shell and a 260-gram fleece liner. You can wear the liner with or without the shell. Sales tax is charged in most states. 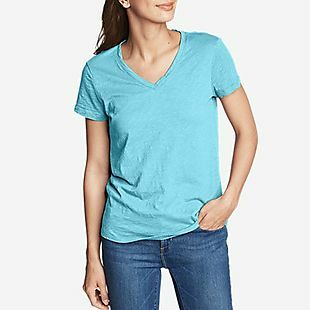 Originally $30, these women's Legend Wash Slub Short-Sleeve V-Neck Tees or Crew-Neck Tees drop to $9.90 at EddieBauer.com when you add promo code BDTEES at checkout. Plus this code bags you free shipping at $25. Otherwise, shipping adds $7.99. This the lowest price we've seen on these styles this season. Choose from multiple colors in XS-XXL. Please note that you can only use one promo code at checkout. Sales tax is charged in most states.